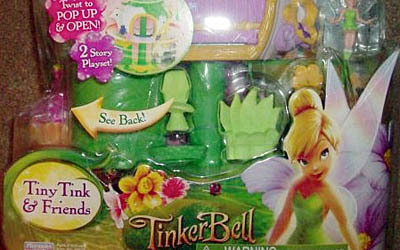 Twist the tea kettle to pop up and open the Tinker Bell playset. Inside is Tinker Bell Doll and her bed, couch, bathtub, butterfly, and bell. Tink's two-story home is a magical place for the tiny fairy to rest and relax. Disney fairies will be at home in this pop-up doll home from Playmate Toys.